Ask any Pakistani cricket fan who our best 3 fast bowlers have been and the answer will almost certainly be unanimous – Wasim, Waqar and Imran. Probe a bit deeper and opinions will start to get divided – while a vast majority will pick Wasim as their favorite and as Pakistan’s best ever, there will be a group more inclined towards Waqar, whereas an earlier generation might lean towards the great Khan. I am going to exclude Imran Khan from this article but before doing that I just want to say that Imran Khan is by far the most talented and best cricketer to have been produced not just by Pakistan but by the Asian continent! The simple numbers make for an interesting comparison. Their averages are very similar but Waqar has a much better strike rate than Wasim, needing almost 2 overs less to pick up a wicket. Their 5 wickets/innings stats are also pretty similar, with Waqar having a slightly better rate than Wasim and there is hardly anything to separate the two in terms of wickets per innings. So while Waqar needed 2 overs less than Wasim to pick up a wicket their wickets/innings numbers are very similar implying Wasim could bowl longer spells and pick up similar number of wickets as Waqar. Now let’s dig a bit deeper and start bisecting their statistics. Again they both have very similar numbers, picking up almost the same number of wickets at similar averages but with Waqar having a superior strike rate to Wasim. An interesting observation here is that Wasim’s stats in matches where Waqar was involved are a significant improvement in comparison to his overall numbers; whereas the difference in Waqar’s performance is marginal. This could be due to Wasim’s skills improving in the later part of his career (post-1989 when Waqar was around) and it could also be due to having Waqar bowling at the other end and putting more pressure on the batsmen. Now this is where it starts getting interesting and there appear some differences between the performances of the two. 4 out of 5 10-wicket hauls for Waqar came in wins; whereas the corresponding figure for Wasim is 2 out of 5. 14 out of 22 5-wicket hauls for Waqar were achieved in games Pakistan went on to win; whereas Wasim has 13 5-wicket hauls in wins from a total of 25. Overall 60% of Waqar’s wickets were taken in matches Pakistan won; whereas 51% of Wasim’s wickets were in wins. Again their averages are very similar but Waqar’s strike rate is once again phenomenal picking up a wicket every 35 balls compared to 42 for Wasim. From the numbers above I think it is a logical conclusion that Waqar had a more significant contribution to wins for Pakistan over his career than Wasim did. Taking the filter another level deeper, I’m now going to look at performance in matches Pakistan won in which both Wasim and Waqar played. Once again, eerily similar stats with the only differentiator being the strike rate, as Waqar needed about an over less to strike than Wasim did. The interesting thing here is again the improvement in Wasim’s stats, especially his wickets per innings in wins where Waqar was involved compared to all wins. This clearly shows that there was a significant positive impact on Wasim’s performance in matches involving Waqar (there could be other factors such as form, stage of Wasim’s career, etc. at play here) over matches not involving Waqar. As yet another way of looking at their performances I’m going to filter their records by opposition. Few would argue that Australia, England, South Africa and West Indies were all very strong teams during the time Wasim and Waqar played their cricket. So I’m going to look at performance against these 4 opponents only (I have purposefully excluded India here since Waqar only played 4 matches against them, 2 in his debut series in 89 and another 2 in 99). Though there is not much to set them apart yet again, it is interesting to note that Waqar’s stats take a bigger hit when looking at his performance against the 4 best sides of the time whereas Wasim’s numbers are relatively closer to his overall performance. However, again Waqar maintains a much better strike rate, which to me is one of the most important indicators for a good test match bowler. Wasim has performed admirably well against the West Indies (average 21 / SR 45) but has strike rates of 60 or above against the other 3 opponents. Waqar struggled badly against Australia (average 34 / SR 63), performed well against the West Indies (average 23 / SR 39), whereas his stats against England and South Africa are better than Wasim (average 28 / SR 50). One of the definitive measures of individual performances are the ICC player rankings, and looking at these it is again Waqar who supersedes Wasim. 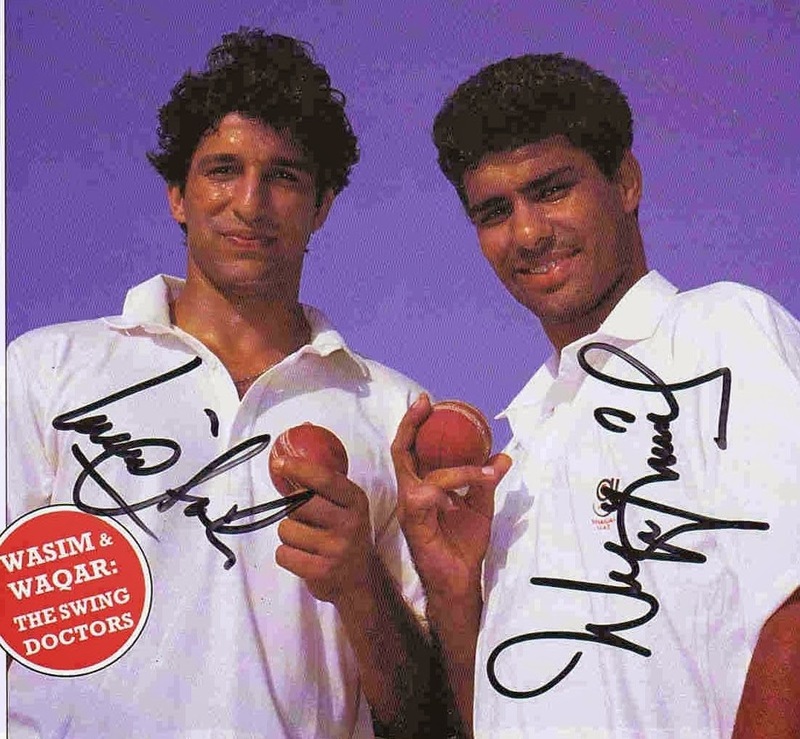 Waqar achieved a career best rating of 909 and achieved the number 1 ranking while Wasim’s best rating was 830 and his best ranking was number 2. Waqar is actually part of a very select group of 21 bowlers in the history of the game who have crossed the 900 mark whereas there are only 9 bowlers who have achieved more than the 909 points that Waqar managed (Barnes, Lohman, Imran Khan, Murali, McGrath, Lock, Ambrose, Botham and Marshal). Let me end by saying that in my view, both Wasim and Waqar were terrific bowlers and there is not much between them in their stats. However, in my book, Waqar’s better strike-rate and his significantly superior contribution in wins puts him marginally above Wasim as Pakistan’s premier test match fast bowler. I long for the day when Pakistan has an opening pair even half as good as the 2 Ws! Besides being pace spearheads and arguably the best fast bowling pair ever to hunt together, Wasim and Waqar were great rivals too. It is no secret that Waqar Younis led a revolt against Wasim Akram to remove the latter from the captaincy in 1993-94, and since then their relationship was never the same. It is quite astonishing that both Wasim and Waqar formed the most lethal pace partnership during a time when they hated each other. 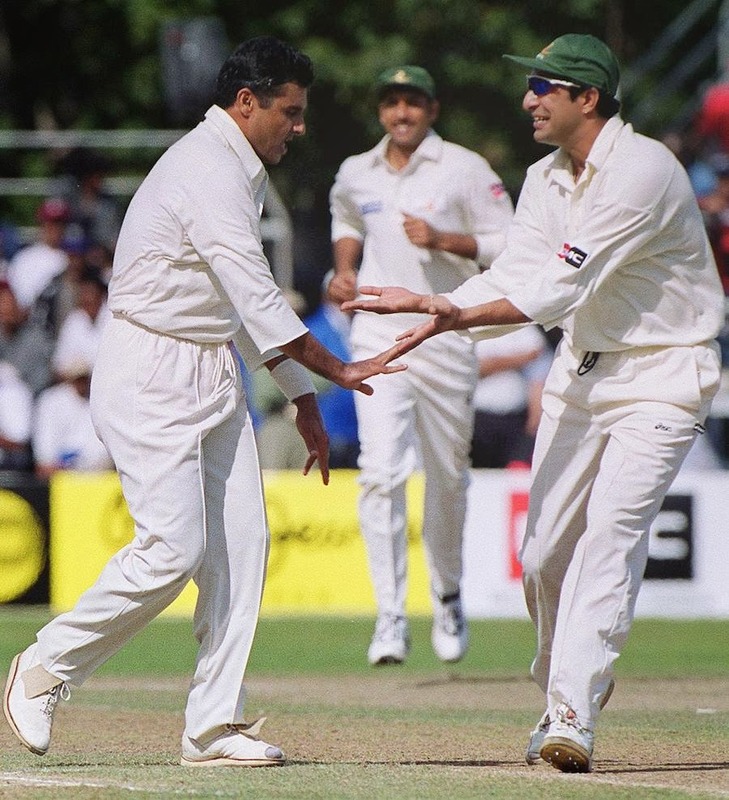 Wasim has openly talked about his rivalry with Waqar in many interviews and his autobiography, and he also explained how Pakistan benefited from this rivalry. Wasim has stated that both him and Waqar were always looking to go one up on the other. If one would take a wicket, the other would try extra hard to get one too. And both wanted to get more wickets than the other to show who is better. This professional rivalry did wonders for Pakistan as both Wasim and Waqar took wickets in heaps and won many a game for Pakistan. There is a drastic improvement. Surely Wasim became a far better bowler in the 90s than in the earlier part of his career, but Waqar's presence had a lot to do with it. The professional rivalry had a lot to do with it. The jealousy of now being shared as Imran Khan's go to bowler had a lot to do with it. The ambition to be the best bowler in Pakistan, the best bowler in the world, had a lot to do with it. Undoubtedly, Waqar Younis brought out the best in Wasim Akram. Wasim & Waqar will forever remain the best pace bowling duo ever in the history of Pakistan cricket, arguably the world as well. you surely deserve a warm round of applause for this magnificent work, especially when class act like waqar has been underrated by so called cricketing genius and commentators. There is no question on Wasim's genius but not placing waqar in ICC hall of fame and rating him far below than akram in Wisden legends is a question on credibility, reliability and cricketing knowledge of jury. I would also request you to compare their ODI stats as well and trust me the results won't differ too much especially in terms of strike rates, no of bowlds and percentage of ducks. good work buddy.... indeed waqar has always been under rated, he was much more quick and attacking, where as wasim was wicked use to move both ways and adjust line and length....but at the end I would saying being a fast bowler and playing for longer period of time is it self the biggest acheivement.... people say that lara, ponting and sangakara is better then tendulkar...ya on strike rates or average they might be...but consistently playing for 24 years is itself a record which no body can break nowadays...similarly the length and fitness of Wasim's career is much longer than waqar and that makes him even better! My two cents on the topic: very superfluous comparison, one very important aspect left behind (I wonder intentionally) that is matches played without the support of each other. The writer mulls it over more than once that whether their rivalry brought the best out of them or not? but did nothing to answer this question. When you do this analysis it becomes very much clear that Waqar's average and strike rate in matches played without Wasim are 25.62 and 46 which are reasonably close to his career average and strike rate of 23.6 and 43. Compare that to Wasim's numbers in matches played without Waqar's support, an average of 28.51 and strike rate of 68 reasonable but not earth shattering, which clearly shows that it was the terror of a Waqar's toe crusher which also helped Wasim to pick some cheap scalps. Even though this comment in no way diminish Wasim's stature as a bowler or his services to Pakistan, but it only proves that Waqar was a better bowler but throw in the addition of Wasim's lower order batting and he was a package of equal if not more value altogether. Don't forget to mention the ability of Wasim Akram to bat in critical conditions many a times e.g., 1992 WC final, even his 257 in test score is higher than batting legend Sachin's. Waqar had two career threatening injuries. In 92 and 96. In 92 he missed the World Cup when he was at his peak, and in 96 the doctor told him he would never walk again and will be in a wheel chair. Yet he still came back. Compare waqar a stats from 89-96 before his second injury they are twice better then 97-2003 when he retired. Compare Wasim and waqar from From 89-96 . Here waqars stats were much significantly greater then Wasims. Although waqar was younger so didn't get the pick of bowling ends etc and was on the end of subcontinental ageist discrimination. Also check the quality of opponents waqar and Wasim got out. Waqar would often get top order out and Wasim would get the tail Enders out esp when the hard work was done at the start by waqar. Accumulate by Counting the batting order of the batsman both waqar and Wasim got out (89-96 or even best five year period eg 90-94) and see who's total amount is the least by average. You will find waqar got out batsmans eg 1,3,4,5 out on average Wasim 9,10,11. Waqar was more of a Match winner. Even Wasim dropped him out of Jealosy when he was captain to curb his stats. If Wasim was better he would feel no Jealosy not any threat. This was not the case. People talk about Wasim being the more complete bowler and having more variations and more talent. This is true. But cricket is not about more talent it is about performance and results and winning matches. This is why waqar was better, not talent alone. Even don bradman says there were more talented batsman than him in his own era, but bradman applied him self more then others, hence the don achieved more then those more talented than him. Imran also says Wasim was more talented then all the Pakistani bowlers at 17, when he came to bowl in the nets before the New Zealand tour. But Imran obviously applied him self more so is Asias no 1 cricketer ever not just Pakistans. Imran also said Mohammad Amir was better then Wasim at age 17 and was the most talent he ever saw in his life. But will Amir apply himself to his best? I guess not he already lost 6 years of non cricket due to other things. Same way muhammad Zahid was faster then shoaib akhtar, shoaib akhtar admits thus, but shoaib applied him self more in the speed contest. Obviously Mohammad Zahid was later injured so he could not continue to break 100mph mark. If waqar himself says Wasim was better, he is referring to talent not performance , which is true, also he is refering to Wasims longevity which is not fair to compare, as after 96 waqar was crippled and had to rehabilitate himself, then remodelled a new bowling action 5-10 miles slower. Which destroyed his reverse swing as reverse swing is optimised at above 90mph+. Waqars career was 14 years long from1989-2003. The first 7 years (upto 1996 when he had the second more major stress factor which nearly left him in a wheel chair for life) his strike rate was around 30, the second (after second injury ) 7 years his strike rate was about 40+. Then you add the two together his strike rate then finished off at about 35. People don't know the above so compare complete careers forgetting major injuries which demonish performance more then anything. Also in county cricket waqar broke records Wasim could not match. His record of 100+ wickets in a season could not be match by Wasim, and waqar led his county teams to championship title but Wasim never did with Lancashire. County stats are more clear give away of who is best. Waqar by a clear long distance 89-96. Waqar was more faster as well. Wasim had diabetes after 96 World Cup. But diabetes can be controlled and us not career threatening like serious stress fractures of the back. Wasim played 5 to 6 test matches at the age of 36 when he did not able to perform well and that affected his overall avg and strike rate..wasim was diabetic too and had an action of few meters than waqar's lengthy action..wasim in my opinion was better than waqar in talent .waqar played 21 matches lesser than wasim.had waqar played 104 test matches equal to wasim played that might affected waqar's performance and his strike rate negatively.. I always thought waqar was perhaps the better bowler. But there's not much in it. We can all agree that in any case wasim could contribute with the bat. Furthermore, you can't ignore inran khan because with an average of just over 22 he could get into a world top 10 based on his bowling alone!